In my opinion the Raider is an awesome gun. It's range isn't anything like modded Nitefinders (or my Big Salvo, which will be in my next post) however what it lacks in power, it easily makes up in rate of fire and ammo capacity. Disclaimer: Modifications may wear out or damage your blaster, I take no responsibility for people trying to do the same as me and breaking any part of their blaster. I did a few mods to my Raider, the first was an Air Restrictor (AR) removal, by using the "pipe-cutter" method. I found that cutting slightly closer to the dip achieved a better result as the inside section then had more pipe to glue to (ask if your performing the mod and your not sure what I mean). I did not put any padding to protect the plunger tube. I took off the safety catch which only lets you prime the blaster if there is a magazine in it, it was quite obvious what it was and was simple to remove. This lets me load darts into the gun by hand, by doing this I can push the darts in further than they would otherwise go. The stock streamlines used to tend to swerve at around 20' making the gun useless at any range above that, however they are now accurate to around 30', or 35' if I load the darts singly. I will probably add to this post after I have some more Nerf war experience with the blaster. In case it isn't obvious enough already, I would like to point out three new additions to this website. The two pages can be accessed by the links under the "UK NERF" heading at the left of the blog. They will be updated and improved regularly. First off is the UK Nerf stocklist, which is extremely useful if your considering buying a blaster, as it shows where to get the best deals on Nerf products. Secondly, I have created a map to contain information about where "nerfers" in the UK are, where shops to buy Nerf products are, and other Nerf related things. This map is called the UK Nerf Location Database (or UKNLD for short). It can be edited by anyone, and I would appreciate it if you, yes you (unless you don't live in the UK, then not you), could contribute to it, at least with your location. Another new thing is the search box on the right. This can not only search this blog, but also other Nerf blogs and Nerf forums. Go on, give it a go. PS. I am selling a Raider CS-35 stock. First off is my black, gold and "leather" Maverick. Yes, I painted over the orange tip. I do not plan on even taking this gun out of my house, so I'm not going to get arrested or shot. This has had its air restrictors removed and a couple of flat (run out of power and flat dimension-wise) batteries put in behind the spring. It is freaking noisy, but has been fired hundreds of times and not broken. 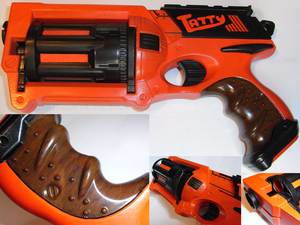 Here is my Girlfriends orange Maverick that I painted for her :D Completely stock internals, and it is colourful enough to use outside. The "wood" grip looks awesome in sunlight, quite proud of it really. 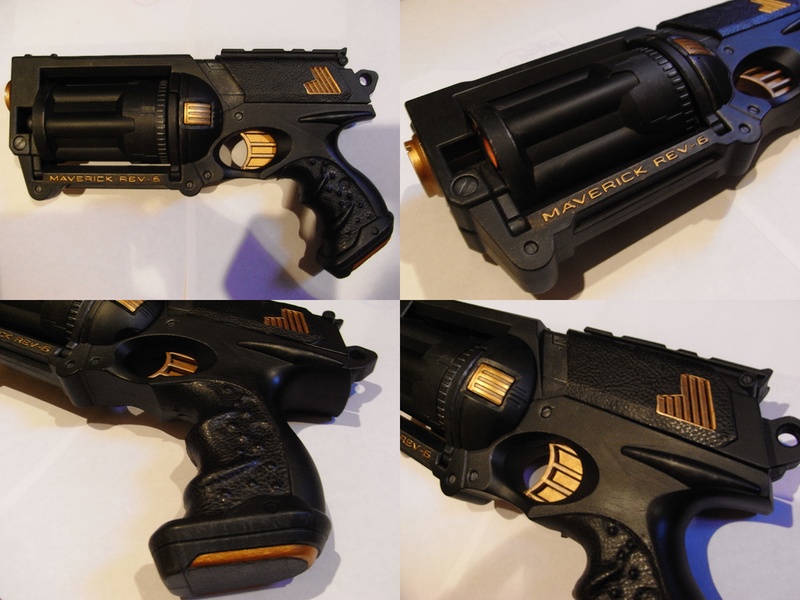 I also have a non-painted Maverick which I use more in games. 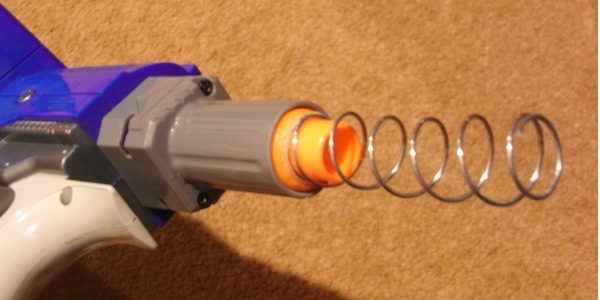 It's had its air restrictors removed, the spring "stretched", and the rotating clip now swings out further.